Oquoa at O’Leaver’s, Aug. 23, 2013. Headliner Oquoa, making its world stage debut, had a similar vibe as Conduits (J.J. Idt’s and Roger Lewis’ former band), but was less droning and more tuneful in a Roxy Music or even Pink Floyd sort of way. The band sounds nothing like frontman Max Holmquist’s former folk rock project Great American Desert, though I can’t be certain of any lyrical similarities as (is the case with most live projects) I couldn’t make out the words. 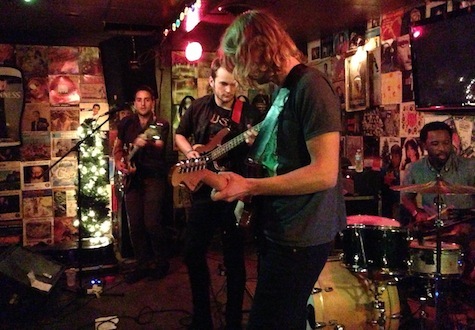 Oquoa moves beyond typical shoegaze to an even denser style of indie rock. Idt’s guitar leads were the essential component — spare, soaring, lean, they breath subtle life into these slow(er) mantra songs. Very David Gilmore. The band’s sound as a whole has a similar dense, delay-heavy push as Conduits, but with more separation between the parts. While Conduits was all about creating atmosphere, Oquoa is about the songs. If you missed them your next chance to catch them is at Jake’s Block party in a couple weeks, where they’ll be playing alongside Twinsmith and See Through Dresses. Electric Chamber Music opened the evening with a long instrumental that glowed with vibes that reminded me of early Tristeza. It was about as far away from the cowboy shoegaze of frontman James Maakestad’s former band, Gus & Call. But that style was short-lived, as the band left the stage so that Maakestad could do a couple folkie numbers on his own. When the band rejoined him the sound had transformed back into the G&S rural folk rock that we’re all familiar with, even ending with a slide-guitar fueled southern-fried rocker that took me back to G&S fave “To the Other Side of Jordan,” powered by Daniel Ocanto’s out-of-this-world drumming. It was one of the biggest crowds I’ve seen at O’Leaver’s in a long time. A real crush mob inside and outside, a testimonial to the intense interest in both these projects.